Today is the 234th birthday of the United States of America and I’m struggling to articulate my feelings and concerns for my country. This morning like millions of Americans I walked outside to hoist the flag to honor my country and convey support for its principles and ideals. I still believe in those principles and ideals but I am having a tremendous crisis of faith on how those principles and ideals are put into action. When I removed the flag from its draw my first thought was a tinge of personal shame because the flag was not properly folded in the requisite three star triangle. This former Boy Scout knew of the proper way to fold the flag but when I lowered it after Memorial Day I had no one to assist me in the proper way to fold it. It takes two people working in common purpose to accomplish the task. One to fold while the other holds the flag taut. It brought to mind my country’s ossified two party systems inability to administer effective governance. Its time we call other care takers who have the conscience and maturity to sacrifice partisanship for the greater good of the country. Holding the flag I was struck by its age. I date the flag to the late 40’s. The flag was given to me by my father and has only 48 stars. When it was sewn Alaska and Hawaii had yet to join the grand union of states. They would join in 59 four years after my birth. This flag boasts strong double stitches that holds the stars, stripes and blue field securely in place. A united conglomeration of shapes, symbols and colors manufactured by top notch craftsmen guided in their work by care and skill to assure quality. I surmise that the workers who crafted this flag were inspired by a love of country and pride of workmanship now long gone. Blue collar workers and the unions that represented them have been crushed by the immutable power of global capital. In the greater cause of profits workplaces have been dismantled and livelihoods off shored to the outer regions of the global economy. I wonder how the 11,000,000 people who are unemployed today perceive our flag this morning? Surely most will bless the grace of daily bread that is placed on their table today. I also wonder if the big time financiers who profit from grief will pause with a moment of reflection during their extravagant soirees on the source of their wealth and the price of their amusements. My flag has but 48 stars. In my short lifetime of 54 years my country granted statehood to two states. Fifty states is a rounded number suggesting a divine hand that predetermined a Pax Americana halfway to a celestial century mark. I worry that this glorious symbol of Federalism is at danger of unraveling again. Texas, Alaska, Arizona and a few other stars have expressed a desire to withdraw their stars from the sacred blue field of our flag. Seditious murmurs from opportunistic politicians. They eagerly dip their political cookies into the toxic brew stewed up by pissed off Teabaggers and other deranged Falangists. This new confederacy condemns them. They complain that the rights of individual states are being trampled upon by an oppressive authoritarian government. They shout prayers from rooftops, wave hand guns, tote rifles and salute the Don’t Tread On Me flag. They want the right to be left alone to create a personal version of a world unencumbered by responsibility to anything but a selfish self. They damn the collective needs of the union and condemn its necessity to operate as an interconnected link in a world fraternity of nations. The ability to express an unencumbered will in the pursuit of self interest is their idea of citizenship. They are prepared to defend it with guns and preemptive aggression to assert the right of the stronger. They prefer barbarity to civility, selfishness to fraternity, personal affectation to civil rights, sameness to diversity, vigilante tribunals to social justice. 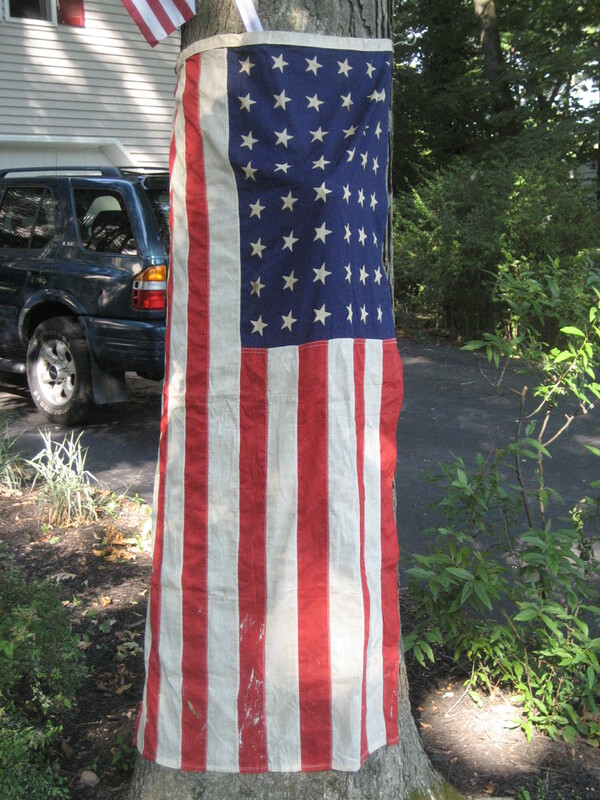 With care and reverence I wrapped the flag around my tree, envisioning flag draped coffins being off loaded from C-130 transport planes onto the impersonal gray tarmac of a military airbase in Dover. These selfless souls are reunited with the ground of the land they gave their last full measure of their devotion offered up to senseless conflicts in Iraq and Afghanistan. The fallen will receive a reverence in death that our politicians failed to offer them in life by condemning them to a wasteful demise, wholly avoidable and absolutely unnecessary. No these unfortunate patriots have not shed their blood in vain. Their stars will forever burn bright on a blue field of valor as condemnation of the blasphemous chicken hawks whose screaming squawks for war are nothing but hallow patriotic pronouncements spoken to secure political careers and profit financial backers. Arranging the flag around the tree the bark of the Black Oak clings to the fabric of Old Glory. It allows me to run a finger along the long red strip at the base of the flag. The blood shed for the cause of this flag continues to flow. When will it ebb? In the cause of this flag seemingly righteous blood mixes with the awful blood of innocents. Both stain the hands and conscience of our nation. My two sons just entering young adulthood are proud members of the armed forces. One in the Navy the other in the Army. Their blood is my blood. They speak of deployment to the “Sand Box” a euphemism for the conflicts in Iraq and Afghanistan. A future raising of this flag lays on my brain like a nightmare, praying that their blood doesn’t stain the grim crimson of our national symbol. Stepping back to examine if the flag is properly hung I notice a paint stain on the field of stripes. The splotch of beige paint now darkly blanched was splashed from a careless paintbrush I used to coat the walls of my boyhood bedroom. I did not take the proper precaution of removing the flag from the wall before proceeding with the task of painting. It was a small blotch about the size of a couple of 50 cent pieces lying on a dresser drawer. It reminds me of the gushing oil spill flowing into the pristine Gulf of Mexico. This catastrophe will forever alter the ecology and lives of the many social and ecological communities that comprise the Gulf. This stain will remain on our flag for many generations. The dimensions of this disaster are still beyond measure or comprehension. It threatens to forever alter the colorful fabric of our culture, economy and political lives. The inexorable march of corporate power in pursuit of profit threatens to crush a sustainable human habitat. We the people alone can call them to account and require that human needs take precedence over corporate greed. Yet today is not the day for a recitation of what I believe to be wrong with my country. Readers of this blog can click any subject on the cloud tag a get my doubled barreled critique of America’s behavior in a rapidly changing world. But I have been struggling for the past few days about a theme for today’s post. And it finally came to me when I was dutifully hanging the flag on this meaningful day. I really want to believe in the correctness and goodness of my country and its people. Its my country warts and all. The warts are growing big and uglier everyday. My country and countrymen have lost their way. Two seemingly endless and pointless wars, the economic debasement of “The Great Recession”, the egregious assault on the delicate ecological communities of the Gulf of Mexico, a voracious Falangist movement, the juggernaut of corporatism, the continual erosion of civil liberties, careless concern for social justice and rapidly accelerating slide into an aggressive self seeking raises my sense of outrage. As a boy growing up this flag hung on the wall of my room for many years. I put it up on my wall when I was an adolescent still playing with toy soldiers. I was enamored with national pride by America’s WWII triumphs, John Wayne war heroics and Victory at Sea news reels. I was a staunch Cold Warrior. During grammar school I imagined myself dying a hero’s death as I fell in the victory over the USSR’s Red Army at the decisive battle of Washington School. That patriotic zeal would continue throughout most of the Vietnam War springing to attention at Sargent Barry Sadler’s Ballad of the Green Berets. On Saturday evenings I would watch the Channel 5 News. I can still hear the solemn grimness of the haunting trumpet dirge as the weekly Honor Roll scrolled the names of the fallen from the conflict in Southeast Asia. As we grow the meanings of symbols change. Symbols can never remain immutably fixed because its subject changes. Failure to understand this the symbol becomes a fiction of stale dogma unconnected to a living reality of real living things in an ever changing world. Inane nationalists content to swaddle themselves in the flag believe their fervor and force of statement is the test of love of country. But in fact these unfortunates trod a dangerous path and in fact pose the greatest risk to the continued wellness of our nations ideals. As the Sixties gave way to the Seventies the meaning of my flag evolved. It became a symbol of imperial power and distrusted authority as the Vietnam war droned on. It became a symbol of naked repression as it quelled urban rebellions. It became a symbol of reaction when assassins silenced beloved reform leaders. It became a symbol of deadly suppression when the Ohio National Guard murdered students at Kent State. this flag would evolve into the sacrilege of a Warholian commercial symbol. To my horror this flag became a weapon in the hands of white racists threatening to use it to impale an African American man during a school busing demonstration in Landsmark in Boston. During college as my political activism grew, Peace flags, Earth Day flags, Liberation flags, Rainbow flags all captured my imagination and had profound personal meaning but they would never replace the preeminent position the American flag holds in my heart. I wish my countrymen well on this July 4th. I behold my incomplete, paint stained, 48 starred Old Glory. Its in a proper place on a good and proper day. The white colors tinged in a yellow fade its getting on in age. But I have hope. I take consolation from a voice resonating in my ear. As a slight breeze ripples the posted colors I recognize the not so distant call of the great abolitionist Frederick Douglas. He’s whispering “agitate, agitate, agitate”……..
We are committed to meaningful, frequent and timely blog entries. It’s a tough assignment trying to fit it in with everything else that is necessary to sustain our business and our lives but we think it important. Like Narcissus we too have fallen in love with our own reflections. The purpose of this Risk Rap is to examine risk and its impact on our culture and lives. This presents a broad enough pallet that pretty much gives us carte blanche to opine on all matters concerning politics, economics, art, religion and social issues. Without fear or favor we will try to offer measured sober assessments of a world at risk and point to solutions to temper the potentially negative aspects of risk while enhancing the positive results and benefits of taking calculated risks. That is our fondest hope and fervent wish.